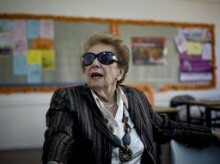 TEL AVIV, Israel (AP) — Lydia Avidan, an elegant 79-year-old widow, walked into a Tel Aviv high school with tears streaking from beneath her tinted sunglasses. She was about to hand over to historians the only mementos she had left from relatives who perished in the Holocaust — a yellowed, cracked letter she had never read and a faded black-and-white photo of her grandparents. Avidan donated the materials at a collection point in the spartan classrooms of the school, where the final relics of the Holocaust were being collected. “Gathering the Fragments” is a project launched by Israel’s Yad Vashem national Holocaust memorial ahead of the country’s annual Holocaust Memorial Day on Monday. The goal is to gather from aging survivors as many artifacts as possible before they — and their stories — are gone forever. Dozens of Israelis arrived with items that had been stashed away for decades. Researchers questioned them, logged their stories, tagged their materials, then scanned their documents into Yad Vashem’s vast digitized archive. With white gloves, they carefully placed larger items into boxes that were later shipped back to the large Yad Vashem compound in Jerusalem. For many, it was a struggle to part with what had become family treasures, their only physical links to ancestors who perished. In addition to rounding up Jews and shipping them to death camps, the Nazis also confiscated their possessions and stole their valuables, leaving little behind. Haim Gertner, director of the Yad Vashem archive, said the collection effort could prove vital for both preservation and research purposes, adding depth to the museum’s existing exhibits and potentially contributing details to Yad Vashem’s huge database of names. The Nazis murdered 6 million Jews during World War II, wiping out a third of world Jewry. Of the victims, only about 4 million names have been gathered by Yad Vashem, which is racing to collect testimonies as well as the historic belongings from some 200,000 survivors in Israel. Yad Vashem also has the means to maintain historical documents that have been damaged over the passing years. The memorial plans 10 collection dates across the country in the coming year. The first such day, on Apr. 13 in Tel Aviv, produced a variety of letters, pictures, diaries and yellow stars — each telling its own unique story. One touching donation was a fraying beige sweater with red pockets and green, butterfly-shaped buttons. It belonged to 8-year-old Gitel Londner, who was separated from her parents in Poland in 1943 and perished in Auschwitz shortly after. The sweater is all her parents had to remember her by and they guarded it religiously throughout their own ordeal through Nazi concentration camps and then for 60 years in Israel. The parents, Ephraim and Mina, had another child after the war. Zehava Mirenberg said her mother never forgave herself for losing Gitel and would never part with the sweater. Mirenberg, 63, said she struggled for years after her parents died over what to do with the sweater but finally decided to donate it for safekeeping. Avidan and her parents had escaped in 1939 on a journey that would take them through Romania and Turkey before they arrived in the British-mandated territory that would later become Israel. She never found out what happened to the rest of her family and only assumed they were exterminated in Auschwitz, as was the rest of their town. An only child, she kept the letter and the picture hidden for years before deciding to come forward after seeing a newspaper ad about the collection drive. But first she wanted to know what the letter said. Her Polish aristocratic parents never spoke about the war and she only discovered the letter after their deaths. All she knew was that the letter was written by her grandparents in Yiddish and in Polish — languages she could not read — and sent from their home in 1940. She had been afraid to probe beyond that. Avidan looked on warily as a Yad Vashem translator began reading. The letter was addressed to her mother, who had just arrived in the Holy Land. In it, her parents wished her luck, telling her to rest up after such a long journey and expressing concern about her new home. The grandparents’ update included that one of them was ill with a fever. Not a word was written about the situation in Nazi-occupied Poland. “They didn’t believe anything would happen, they thought the Germans would just pass through and things would go back to normal,” a tearful Avidan said. She said she felt relief at finally learning what she had saved all these years and was at peace with handing it over.